Some animals are tougher than others but this brave moggy really is rock hard after he was found covered in concrete. The little ginger tom was originally mistaken for a pile of parcel tape after Faye Richards opened her door and saw the peculiar bundle sitting in front of her. It was only after a closer look that mum-of-two Faye, 39, then realised the shape was actually a concrete-coated kitty sitting outside her home in Withywood, Bristol, on Thursday. The fed-up feline was covered in so much concrete he was unable to open his eyes, so Faye immediately picked him up and rushed him down to her local vet. Once inside the hapless cat had all his hair shaved off before being combed through to remove the remaining concrete. Medical receptionist Faye said: “At first I thought it was a screwed up ball of brown parcel tape that had been blown onto my front step. “It was only when I got closer I realised it was a cat. “The concrete had started to go rock hard on his back, but his belly was still soaking wet and he could barely open his eyes. “It was all over its face and it was absolutely solid. He couldn’t even move. He was crying a lot and shivering. He was really cold. Faye, who has three other cats, said: “I felt really sorry for him and shocked. “I don’t know if it was deliberate or not but I can’t think of anywhere round here where there is cement for him to fall into. “You would hate to think of something doing this intentionally but you do hear of it happening. The cat, who has no microchip to identify him and has not been neutered, has now been completely shaved. He is currently staying with the vet who cared for him and is on his way to making a full recovery. Emily Slater, of The Vet in Hengrove, Bristol, said: “It was quite sad to see him in that state. 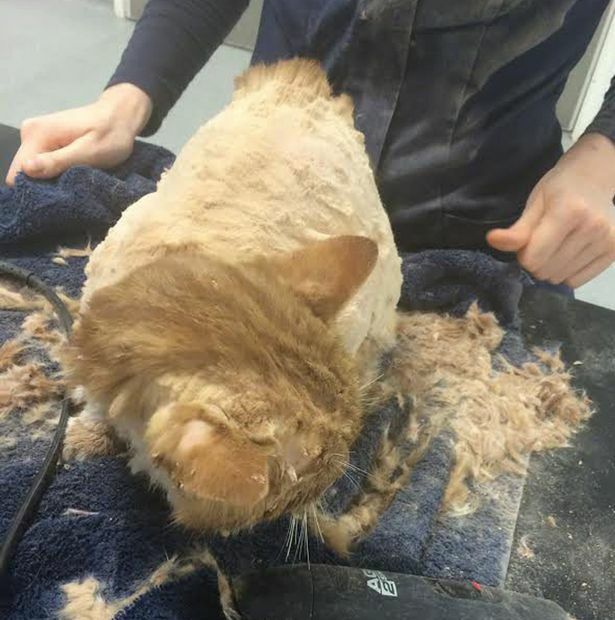 “We had to shave him and comb it all out of his hair, including the fur on his head. “He had managed to get it into his eyes as well so he had to have them flushed, and the vet was worried that he could’ve inhaled some of the cement dust.